For every 500 Likes we will raffle off a Christmas Hamper worth over $100! Santa had such fun at the Christmas Markets GC last year and can't wait to see you all again this December 14th, 15th & 16th. The Christmas Markets GC will be returning at 4pm until 10pm on the 14th, 15th and 16th of December 2018 to bring cheer and merriment to Gold Coast families. Take the stress out of Christmas with friends and family and enjoy a relaxing stroll through a menagerie of unique gifts, taste the delectable Yuletide treats and tantalize the senses with the essence of real Christmas trees. 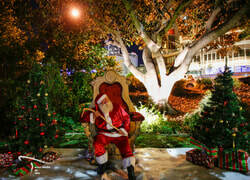 Nestled among an enchanting display of shimmering lights the Christmas Markets GC will set the scene for couples and families alike, whether it be a romantic wander for two or a fun-filled night out with the family. There's sure to be something for everyone! And best of all, its free to come along! ﻿﻿Our stallholders and food vendor are looking forward to seeing you there! If you would like to help us make someone's Christmas Day contact us through the Contact Us page. Christmas Markets GC are proudly brought to you by the not-for-profit association Christmas Spirit Group. We wish you a Merry Christmas and a jolly time at the Markets.